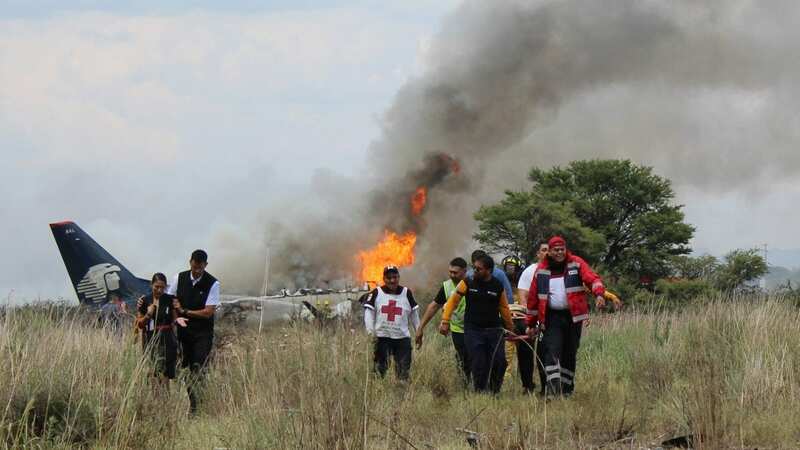 Officials said 85 of the survivors who got out of the burning Aeromexico Embraer E190 suffered injuries in the crash. The Associated Press, citing a Durango state Health Ministry spokesman, said 49 people were hospitalized, most with minor injuries. “The pilot suffered the most serious injury, a cervical lesion that required surgery. Some people had burns on a quarter of their bodies,” the AP said. Shaken passengers expressed gratitude for being alive. “It was really, really ugly,” Lorenzo Nunez, a passenger from Chicago who fled the plane with his two sons and wife told reporters, according to the AP. Flight AM2431 took off in a heavy hailstorm from Guadalupe Victoria International Airport bound for Mexico City. The airport operator, Grupo Aeroportuario Centro Norte, said initial indications are that the weather was the cause of the crash, according to the BBC. Durango state Gov. Jose Aispuro said passengers reported a loud bang as the plane’s left wing hit the ground and the engines tore loose. The accident occurred at about 4 p.m. local time. He said it was too soon to speculate on the cause of the crash. “Many managed to leave the plane on foot,” Civil defense spokesperson Alejandro Cardoza was quoted by the BBC as saying. He said the fire that started after the crash was put out.